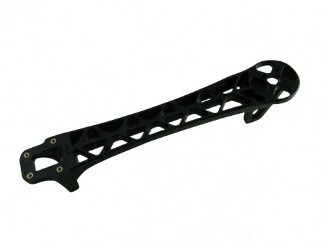 DJI F550 Flame Wheel replacement arm Black. The DJI Flame Wheel F550 frame arms are built from very strong materials, these F550 arms are made from the ultra strong PA66+30GF material which provides better resistance to damage on hard landings. These arms are supplied in one's, please order the number required. These arms are a good price, so I had to confirm prior before purchase that they were the genuine article. I recieve a prompt reply confirming that they were. I ordered them and recieved them next day. Wouldn't waste my money on clone arms , these are better grade of plastic which are in airtight sealed bags to preserve the plastics moisture content, thus ensuring their strength and durability. Great service. Hello everyone, I bought a second time these articles and BYOD has not disappointed me for the second time. Fast delivery to Italy, packaging and proper care. Congratulations, reliable website and recommended. I purchased these parts for my frame on 13/01/2015 arrived in Milano (Italy) on 01/22/2015. material conforms to what appears in the website, it's original DJI arms with logo.